Fossils from the few other Gondwana sites in the Late Jurassic are scrappy. Tendaguru East Africa the best southern site known mirrors the Morrison Fauna of North America. Prior to World War 1 a German team excavated in East Africa. Late Jurassic Tendaguru is a warm coastal plain subject to periodic possibly season droughts. 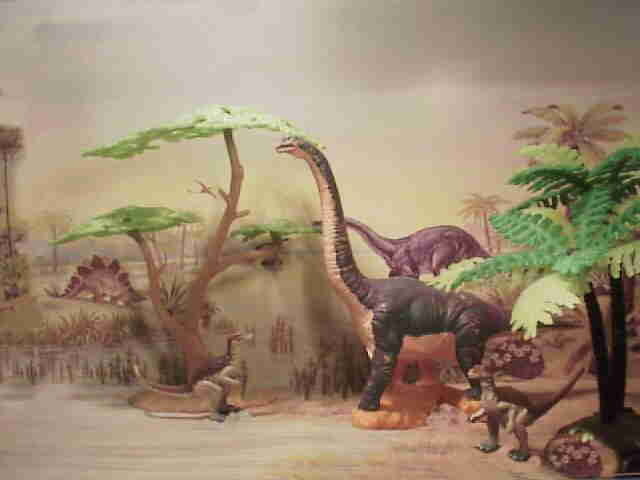 The fauna is dominated by the sauropods Dicraeosaurus, Brachiosaurus, Barosaurus, Tornieria and Janenschia. represents a branch of the diplodocid family not found in the northern continents. The other sauropods are merged into North American groups. Dicraeosaurus. Barosaurus and Allosaurus are both known from North America and Africa. Barosaurus is a rare close relative of Diplodocus. Its presence at sites across the world shows the close contact between the continents at the time. Camptosaurus is known from Europe and North America and may well have occurred in Africa. Its smaller relative Dryosaurus has been found in Africa. The sauropods from Tendengaru have gone through a series of names changes which make reading the sources very confusing to a layman because the same animal has several different names. You can find names that actually refer to the same animal presented as different animals in the same reference. As best as I can follow the course of events is that originally two diplodocids were found and named Gigatosaurus africanus and Gigatosaurus robustus. Since the name Gigatosaurus was already used the names were later changed to Tornieria africanus and Tornieria robustus. Next Tornieria africanus is described as a diplodocid closely related to Diplodocus and Barosaurus. Based on the elongated neck vertebrates it was then considered a species of Barosaurus. So Barosaurus africanus replaces Tornieria africanus. This makes Tornieria a junior synonym for Barosaurus so it can't be used by another animal. That means Tornieria robustus needed a new name. The new name was Janenschia robustus. Exactly where Janenschia falls is debated it might be a titanosaur the oldest known member of the family that dominated Gondwanaland in the Cretaceous. A common view is that it is a composite of fossils from more than one type of animal. Tendengaru fossils were not found articulated so deciding what belongs to who can be problematic. A further complication is that much of the original material was destroyed during World War 2 and no new excavations have been attempted. Most recently Barosaurus africanus has been revised again. It was redescribed and identified as a relative of but distinct from Barosaurus. So Tornieria is revived for africanus but not for Janenschia which may not be valid in any case. Not all the various name changes are accepted by all professionals. Giraffatitan brancaiis (giraffe titan) a new genus proposed for Brachiosaurus brancai based on differences in the bones recovered. Even if this is accepted the relationship to the North America brachiosaurs is close. (arm lizard) at 98 feet in length is the the high browser at Tendengaru and Brachiosaurus brancai . Camptosaurus is the largest known orinithischian at 20 feet. The medium size Dicraeosaurus is another relative of Diplodocus and is characterized by high back bones that would have given it a humped back look. Dicraeosaurus represents a branch of the diplodocid family not found in the northern continents. There is an implied relationship to fauna now being found in patagonia. 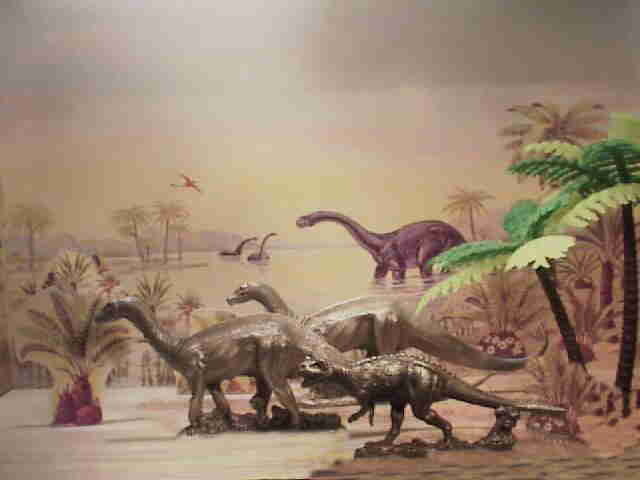 Relatives are found into the Cretaceous in South America. Ceratosaurus and other theropods are implied from scrappy finds.